French President Emmanuel Macron has condemned violence by protesters at demonstrations against rising fuel taxes and his government. Violent clashes between police and protesters are ongoing in the French capital, with demonstrators angry about rising fuel taxes and President Emmanuel Macron’s government. 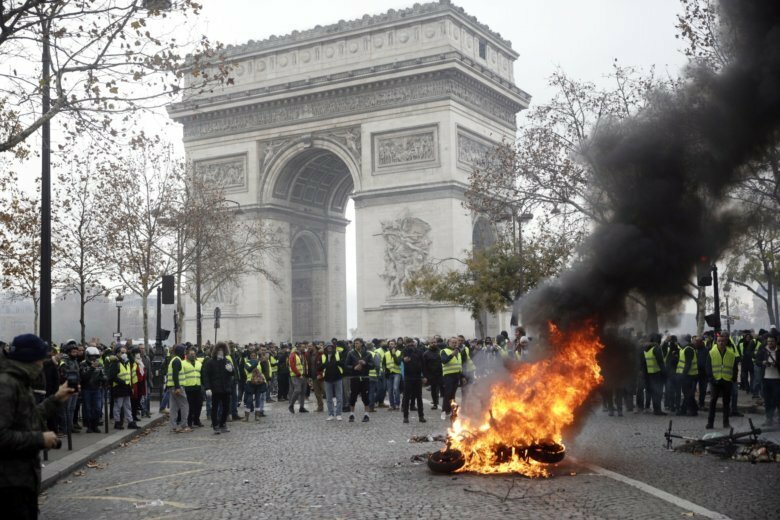 Protesters burned large plywood sheets and other material in the middle of several streets in central Paris, sending up large columns of smoke. Demonstrators also hurled rocks and other projectiles at police, who responded by firing tear gas and bursts from water cannons. French police have fired tear gas and water cannons to disperse demonstrators in Paris, as thousands gathered in the capital and staged road blockades across the nation to vent anger against rising fuel taxes and Emmanuel Macron’s presidency. Thousands of police have been deployed nationwide to contain the demonstrations, including a tense protest at the foot of the Champs-Elysees where protesters upturned a large vehicle. Six people have been arrested. France is deploying thousands of police to try to contain nationwide protests and road blockades by drivers angry over rising fuel taxes and Emmanuel Macron’s presidency. A new wave of protests is planned Saturday, including beneath the Eiffel Tower. Interior Minister Christophe Castaner called for calm and promised tough police measures against unruly crowds. Paris alone is deploying some 3,000 security forces, notably around tourist-frequented areas like the Champs-Elysees, after an unauthorized attempt last week to march on the presidential palace.